Nothing makes the husband and wife team of Dave and Karen Chevalier happier than a satisfied customer. 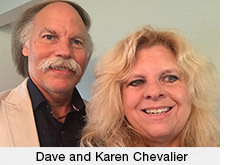 As independent agents, she and Dave operate bus terminals in Bay City and Saginaw that serve passengers on Indian Trails’ daily scheduled inter-city routes throughout Michigan and into Chicago, Duluth and Milwaukee. They help connect travelers in their area with over 100 locations, as well as with the Amtrak and Greyhound national transportation networks, and the Detroit and Flint international airports. In addition, the Chevaliers serve as group charter customers of Indian Trails, arranging custom trips for groups from K-12 schools and colleges, corporations, churches, retirees and more. They’ve been partnering with us for more than 40 years. 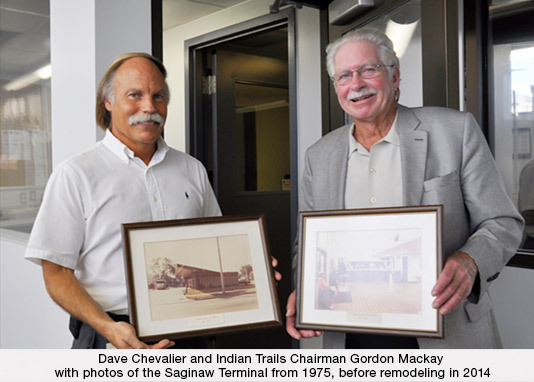 It was Dave who first started as an agent at the Saginaw Terminal when there was a Greyhound-Indian Trails connection there in the early 1970s. Today, the couple runs terminals both in Saginaw and Bay City. The group charter business started as kind of hobby for Karen, as the couple, who married in 1972, was raising their five sons and while she was helping out with paperwork and other duties for the regularly scheduled runs. Although the Chevaliers have used other companies to provide buses for charter trips, they tend to turn to Indian Trails first to check on the availability of our luxury motorcoaches. As an example, a group charter passenger recently wanted to know if there would be enough room to stow her motorized scooter in the luggage bay of one of our new motorcoaches. Karen double-checked the dimensions, and was pleased to report that it would fit. The Chevaliers say they like working with people, and view themselves as problem-solvers whose association with Indian Trails over more than four decades has also brought them personal satisfaction. It’s a rare company today that doesn’t rely on information technology in some way. At Indian Trails, it’s used in every department and for business-critical functions ranging from financial accounting and charter trip planning to geo-tracking buses in real time and monitoring their need for maintenance. To keep it all humming, we rely on IT Manager Tim Allen. He’s been with us since early 2016, serving as expert trouble-shooter for the onboard computer technology in each of our motorcoaches, as well as for our office computer systems. “Tim has been a godsend to our company with his expertise and the research he does into ways technology can serve us better,” says Ody Norkin, vice president of Michigan Flyer, the division of Indian Trails that offers frequent daily shuttle service between East Lansing, Ann Arbor and Detroit Metro Airport. Satellite-based GPS systems that pinpoint the location of every Indian Trails bus on the road, sending the information to a computer on each bus every 30 to 60 seconds. Those onboard computers—called Electronic Logging Devices—not only collect the GPS data, but monitor each bus’s speed, any idling or hard braking events, and various engine performance metrics. This information is continuously transmitted through the cellular network to a secure data center. At the data center, the GPS coordinates of each bus are displayed on Google Maps, along with who’s driving, what run or charter number they’re operating, and whether or not they’re on schedule, as well as any engine diagnostic data that indicates something could possibly be amiss. There’s also a map overlay that shows accidents and traffic backups in real-time. All of this is sent to computers in the Indian Trails Dispatch center at our headquarters in Owosso, which coordinates the responses of maintenance facilities there, as well as in Kalamazoo and Romulus. Right now, Allen is gearing up to launch a new tracking app via the Saucon system for all Indian Trails scheduled service motorcoaches—including those of Michigan Flyer—that will better convey information that both the Dispatch center and passengers want. It will show the whereabouts of each bus at any given time. Allen, a native of Lake Fenton who now lives in Owosso, grew up on a farm but learned about electronics during a six-year stint with the U.S. Navy. “In high school I was interested in subjects like electronics and drafting, so it seemed natural to choose training in electronics and radar while I was in the service,” he said. After his discharge, he worked in IT for Burroughs/Unisys for 12 years and then The State Bank in Fenton for 20 years. He heard about the open IT position at Indian Trails through a neighbor. Here in Part 2, we explain how and why Amtrak, the major airlines, and Detroit Metro Airport deal with passengers who travel with animals. 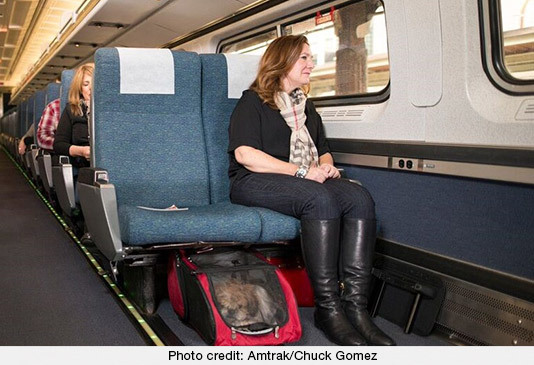 In most respects, Amtrak’s policy on service animals is similar to that for buses: Dogs and miniature horses trained to perform a specific task for the benefit of a person with a disability qualify as actual service animals and can ride for free. These service animals must be kept under control and remain on the floor in their handler’s space at all times. For an additional $25, passengers are allowed to bring one such pet on trips of up to seven hours long (including transfer times on multi-segment trips). Pet reservations are made on a first-come, first-served basis; there's a maximum of five pets per train. A pet can weigh no more than 20 pounds, including the well-ventilated, leak-proof carrier in which it must stay while on board. People in more than 100 towns served by Indian Trails’ daily bus routes throughout Michigan can connect with Amtrak’s runs between Chicago and Detroit, Grand Rapids and Port Huron. Such “thruway connections” between Indian Trails and Amtrak enable travelers in many Michigan towns to purchase a single ticket on the Amtrak.com website that includes travel on both the train and bus segments of their trips. However, pets cannot be booked on Indian Trail’s coaches by using such multi-ride tickets. The major airlines don’t do this because they love all creatures great and small, domestic or exotic. Fit to be tied, they dislike headlines about passengers trying to board with comfort turkeys or ducks, capuchin monkeys, rabbits, emotional support pigs and peacocks, little possums called “sugar gliders,” goats, iguanas, hedgehogs, etc. It’s just that airlines are bound by the federal Air Carrier Access Act (ACAA), which requires them to allow both service animals and emotional support animals to accompany their handlers in the cabin of the aircraft. According to the U.S. Dept. of Transportation (USDOT), a service animal—as broadly defined in the ACAA--may safely sit in the lap of its owner during taxiing, take-off, and landing if the animal is no larger than a child less than two years old. The U.S. Justice Department enforces the ADA, while USDOT enforces the conflicting ACAA. Under the ACAA, emotional and psychiatric support animals fly in the cabin for free, unlike household pets, for which airlines typically charge a fee such as $125 by United Airlines. (Enter the purveyors of the fraudulent credentials that let people game the system with untrained creatures masquerading as medically necessary support animals). Then there’s TSA Security Screening, which requires that a passenger with a disability and his/her service animal be screened by walking through a metal detector, either together or with the passenger leading the animal through separately on a leash. It’s a bit different with pets, which all “should be brought to the security checkpoint in a hand-held travel carrier.” After that, the pet can be taken out of the carrier and walked through the screening process in the passenger’s arms or on a leash. New rules on air travel with animals are coming from USDOT that may or may not iron out differences in its approach and the Justice Department’s enforcement of the ADA. If you’d like to find out more, you can do so here. Regular readers may recall that in our May issue of Indian Trails Express we wrote about Jenn Carpenter who, with her husband Dax, launched Demented Mitten Tours in 2016. Her company uses our charter coaches to take folks to sites in the Greater Lansing, Mich., area that are said to be haunted or the scenes of terrible crimes. Her new book, “Haunted Lansing” was released earlier this month. Fans of the paranormal can find the book here, just in time for Halloween.